The "boiz" from Scenic Route to Alaska have always given me great opportunities to create such interesting music videos for them and their awesome music. The "boiz" from Scenic Route to Alaska have always given me great opportunities to create such interesting music videos for them and their awesome music. The idea for this video was thought up over a breakfast meeting at The Next Act only weeks prior to the shoot date. It was inspired by childhood memories of wrestling on TV, immediately locking in the creative for this piece. We finished our bacon and eggs, and the planning was on! We only had one day to shoot this entire video, and wanted to keep things as simple as possible. I had decided that a single light source from above was the best way to go, it would create the dramatic top light that I was looking for and it would also let the background fall off quickly. We mounted our lights directly above the ring, using one Arri 2K, and two Arri 1K's. This light source paired with a hazer gave us the perfect look for a grungy underground wrestling ring. I had shot this entire video on the RED Epic - W and Schneider Xenon FF Primes. 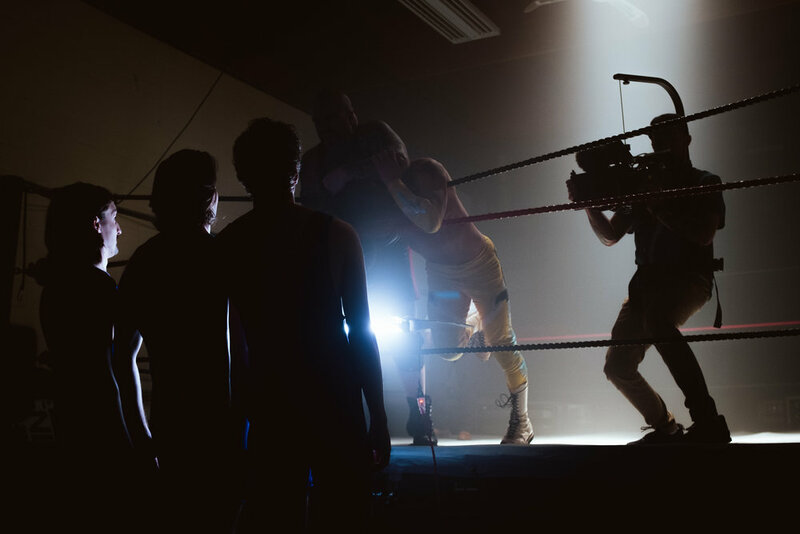 We kept the majority of shots in standard 23.98fps to achieve the desired hectic wrestling effect. Stepping up to 100fps when we really wanted to emphasize some hard hitting points. Corey Sadoway doubled as my AC and grip for this shoot. The use of haze kept our light source narrow and avoided spill. Mike Robertson had directed the boys along throughout this video. With only two formal days of wresting training from Sean Dunster also known as "Massive Damage", the boys picked up the routine and pushed their bodies to the limits while creating this video.